I've recently created a skin care routine that I've been loving and have noticed some good results since starting it. I have to admit, over the past few months I've been lazy when it comes to skin care. I haven't been looking after it, I've been eating a lot chocolate, Easter and family birthdays don't help, and my skin has looked horrible. Fast forward to today and my skin is starting to get back on track. I'm even drinking a smoothie as I type this in the hope it will also help my skin. It's cherry and banana if you wanted to know. So onto the products that have made a huge difference. I only use these at night because my skin is very sensitive and thanks to years of eczema it doesn't do so well with cleansing. With using enough moisturising products I find I can get around with only applying products once. I'm hoping at some point my skin will get a lot better and I can start introducing a morning routine. I'm not there yet though. So I start off with taking my eye make-up off with micellar solution. 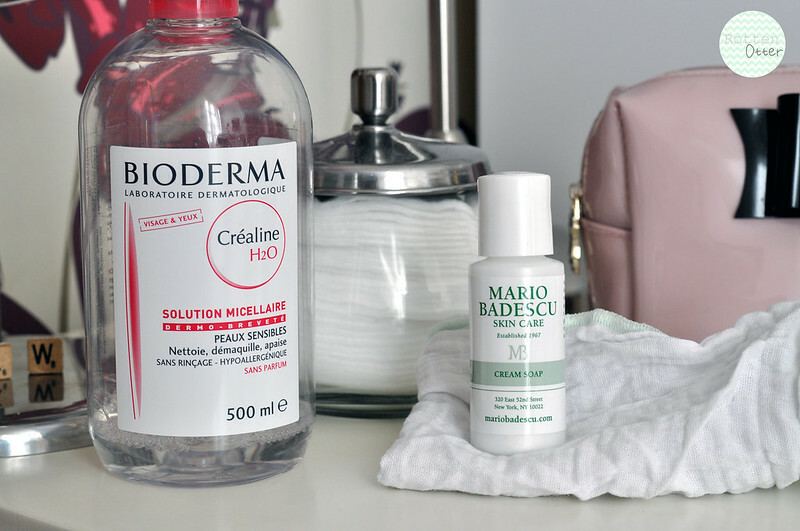 While I took these photos I was using Bioderma Crealine H20 but that has since ran out. I'm currently trying out a Caudalie version and will then start on the giant bottle of Taaj micellar solution I have. This is the only step I don't mind changing up once products run out but I will probably go back to Bioderma. I then wash my face with Mario Badescu Cream soap which I got a sample of in a Beauty Bay order. I would never have tried this cleanser otherwise but I'm so glad I did. I was starting to not like the Liz Earle Cleanse & Polish and wanted something that felt more like a cleanser and this ticks all the boxes. It's very gentle, foams up slightly and washes away easily. I remove it with a muslin cloth for a bit of exfoliation. It also smells slightly of coconut which I love and is a funny silver colour, not what I was expecting at all. For toner I use the Caudalie Beauty Elixir which I have just bought a second bottle of. I could of sprays of this all other my face really helps to relax me before bed. The smell and how it makes my skin feel is just really nice. I think it makes a difference to my skin but then it could just be a combination of all the products. 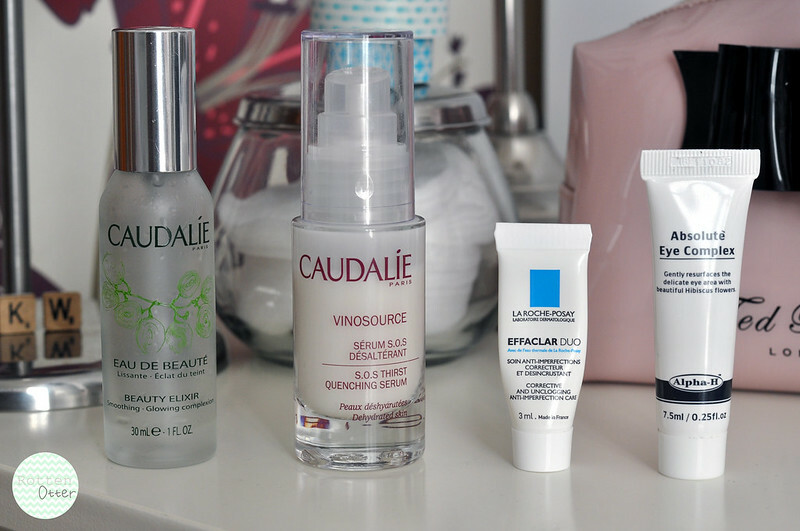 Before my moisturiser I use Caudalie Vinosource S.O.S First Quenching Serum which I've loved ever since I tried it in a beauty box. It smells amazing and it really helps to moisturise and hydrate my skin. Even though I have very dry skin I don't use a thick moisturiser as my skin is also prone to break outs so this helps to even things out. I notice a huge difference if I miss this step out. For my moisturiser I use the La Roche-Posay Effaclar Duo which is the newest addition to my routine. I've had a sample of this ever since I bought the La Roche-Posay try before you buy set from Esecntual but never though it would work for my skin. After reading countless reviews of it I decided to just give it a try and my skin was in a horrible state at that point. I loved it from the first try and have since finished the two sample tubes and bought the full size. It moisturisers my skin but in a light way so it doesn't cause spots and helps to unclog problem areas. I have finally found an eye cream that I love, Alpha H Absolute Eye Complex. This this is another sample from Beauty Bay and I'll definitely be buying the full size once it runs out. It's a gel eye cream which is what I prefer as I can get though horrible white bumps if I use something too thick. It makes my eye area look brighter and more awake. 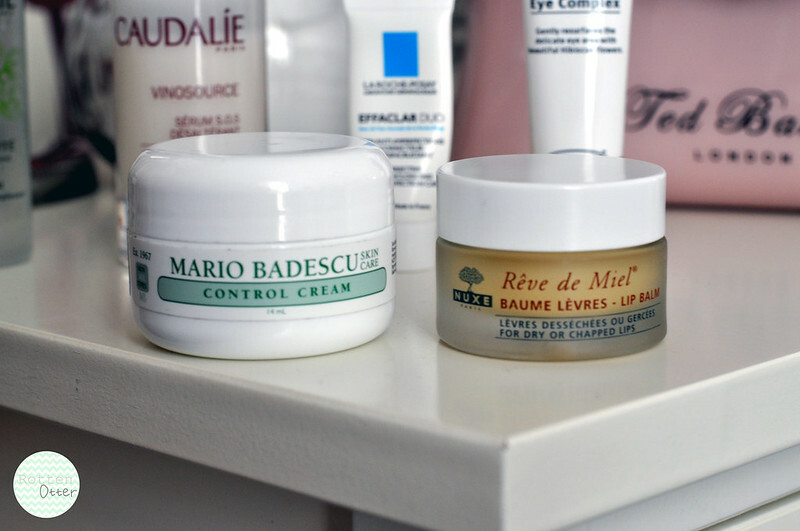 To get rid of any stubborn dry eczema patches I'm still using my holy grail product, Mario Badescu Control Cream. You can read more about it in my full review. Finally the last product I apply if the Nuxe Reve De Miel Lip Balm which is perfect as the balm lasts all night and you can still feel it when you wake up. The smell is also amazing! Apologies for the extra long blog post! What products are included in your everyday routine? I love mario badescu and the control cream and cream soap sound like two products that would be absolutely perfect for me. I'm surprised I haven't discovered them before!! I appreciated this article so much. Thank you for sharing your sincerity thinking. It was really respected.